Unfortunately at this time default 3dsmax Vray will not output a correctly optimized Multi element EXR (external programs i.e NUKE allowing only loading of elements that are requested. This saves on load/read time). 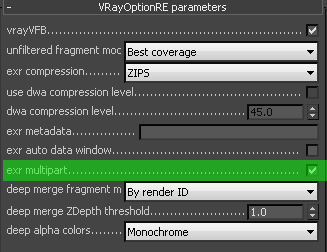 Vray 3.3 has added a option in the render elements called VRayOptionRE. The official help file has nothing on it but it did help us at Teague.